Website visitors can zoom right into specific features in the image and can view great details for each featured area of the campus. Our thoughtful approach allows you to see all the important areas on campus while appreciating the exquisite scenery of the mountain areas surrounding Estes Park. Up until now, there were really only a couple of ways you could experience the Eagle Rock campus. You could hear about it from the educators, staff and students. Or you could schedule a visit to take in the crisp mountain-fresh air and physically explore this pristine setting yourself. With the new Interactive Campus Tour feature on the Eagle Rock website, visitors get an eagle’s-eye view — from high in the sky — looking down on the entire campus. The view includes the winding mountain road that brings you to this remote location, to the jaw-dropping contrast of elegant evergreens and massive outcroppings of rock and boulder that accent the mountainside. And to top it all off, your screen reveals sweeping panoramic views of Colorado’s finest mountains and skies, largely untouched by man’s quest to build and develop. 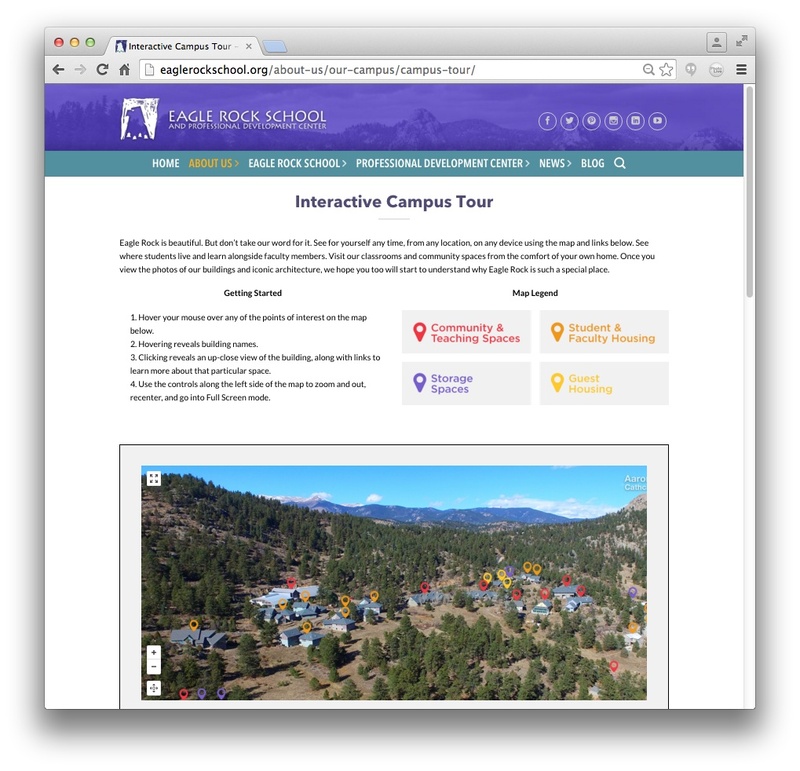 Eagle Rock’s new interactive tour allows visitors to zoom into the campus to see the details, with color coding on every structure to make it simple to explore by building type. Click or touch any marker to get a quick look, and you can click the associated “Visit” link to dive deeper into that campus feature. Learn about each building in greater detail, and enjoy a candid experience through photos, (future) videos and more. We are regularly adding new captioned photos, video and other information to create an always up-to-date presentation of this beautiful campus. Through our assignment here, we have found Eagle Rock School and its Professional Development Center to offer an unmatched experience in education. We hope what we are presenting on the website captures the spirit of this campus just outside of beautiful Estes Park, where there is room to grow, to think, and to change the way education helps young people. This entry was posted in Life at Eagle Rock School and tagged Campus Tour, Christian Riggs, Interactive Campus Tour, Riggs Creative.